This has been a good season for NGC 7331 with many fine images posted to the forums. I thought to update my older image and add to this years collection. NGC 7331 is the bright member of the Deer Lick group - which is an optical grouping base on relative distances. The other four galaxies are NGC 7335, 7336, 7337, and 7340 and sometimes called the "fleas". All of the "fleas" except for NGC 7336 are, however, part of the physical galaxy group HDC 1198 (distance 276 mly). These "fleas" are not the Dwarfs mentioned in the subject. A 2012 paper on Giant GAlaxies Dwarfs and Debris Survey (GGADDS) by Ludwig et al identified four dwarf galaxy candidates associated with NGC 7331. They can be seen in my image (well at least three can and the fourth is there if you turn your monitor very bright). These are identified as NGC 7331 A, B, C, D and are now included in the Simbad and NED databases. 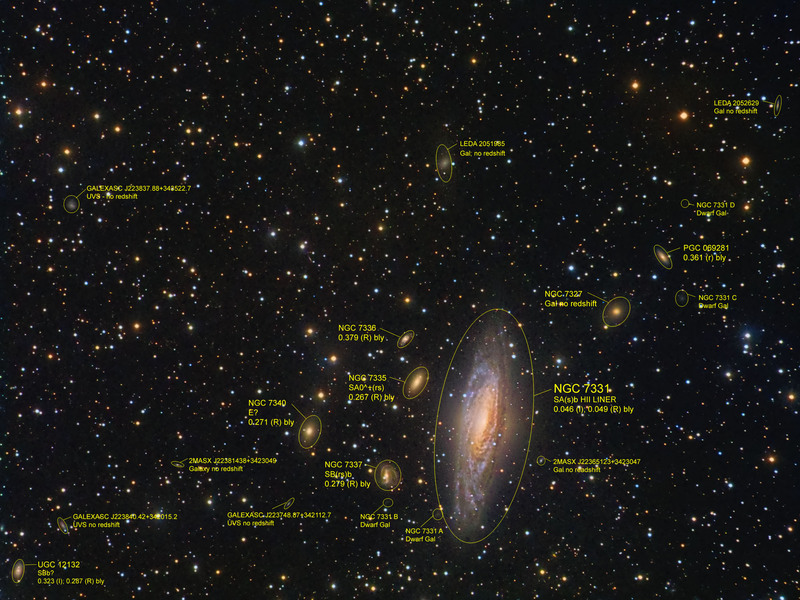 The annotated image shows these dwarfs. The main mage page can be accessed at the link below; the main page has links to a full resolution image and annotated image as well as technical details and information. For convenience, I also provide a link to the annotated image below which shows the Dwarfs as well as several other background galaxies. I really like the velvety black background and coloring of the galaxy Jim. Nice work. Colors and details are so crisp. Excellent work as always, Jim. Edited by liors, 22 October 2018 - 06:56 AM. Well done, Jim. Nice colors as well! Wonderful image, excellent colors and focus! !